It only takes a few minutes to turn a side dish of plain rice into cranberry pecan rice pilaf. 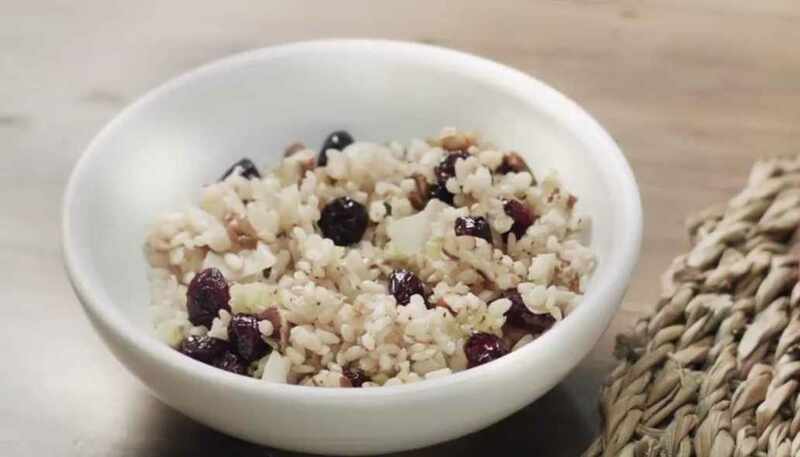 Reinvent brown rice with the simple addition of cranberries, pecans, fresh thyme and sauteed celery. Once you get the hang of this formula to bulk up rice, change the nuts and dried fruit to suit your taste. Journalists: The broadcast-quality video (1:04) is in the downloads. Warm a large nonstick saute pan to medium heat. Add the olive oil, and saute the onion and celery. Once the vegetables become soft and tender, add the cooked rice, pecans, cranberries, thyme and salt. Mix until combined and warmed through.